Keith Negley, author of Tough Guys Have Feelings Too and My Dad Used to Be So Cool turns to questions of feminism in Mary Wears What She Wants. The simple story of a young girl defying social norms and choosing comfort over decorum could be inspiring, but cloaked as this one is, in a historical timeframe, it's jarring and anachronistic. 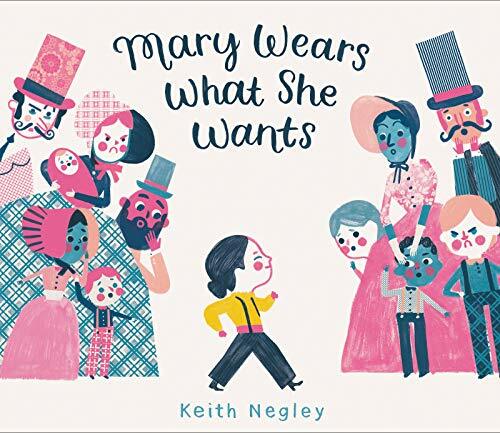 Loosely presented as the story of Mary Edwards Walker, a woman born in 1832, who shocked her contemporaries by wearing pants, this simple picture book is not at all Mary Edwards Walker's story. She didn't inspire her classmates to wear pants, as the little girl in Negley's book does. Nor did she convince society that girls should have the freedom to wear whatever they wanted. That didn't happen in her lifetime or several lifetimes thereafter. As a woman who remembers the dress code in Los Angeles public schools requiring girls to wear dresses in the not-so-distant past, this book paints an infuriating gloss over gender inequalities, presenting the problem of dress as one solved long ago. Walker started by wearing pants under dresses just as we wore shorts under the mandated skirts we had to wear. Attitudes in the 1960s were not so different from those of the 1860s. The cheery last page of this book promises a different ending, as if ever since Walker started this trend, girls have been able to wear what they want. If only that were true! By calling the book “inspired by Mary Edwards Walker,” the publisher hopes to avoid the gnarly issues of historical accuracy. But either the book is about Walker or it isn't. Truthfully, the simple plot of choosing to wear pants despite risking social isolation, being determined to follow one's own truth, and in the end feeling accepted and appreciated is a sweet morality tale, but not at all reflective of Walker's life or women's reality. Walker was arrested many times for wearing pants (for a woman to dress as a man was seen as a crime against social norms). Yet she bravely persevered in her fight against the restrictions women faced, went to medical school, and volunteered as a surgeon during the Civil War, work that was recognized by the Congressional Medal of Honor— an award that was revoked in 1917, then granted again by President Jimmy Carter in 1977. The backmatter of the book gives a quick summary of Walker's biography since the actual story is only marginally reflective of her life in the barest possible way. And here, too, the writing skates over history. Walker was indeed the only woman to receive the Congressional Medal of Honor. But the Congressional Gold Medal was given to the WASP, the Women's Airforce Service Pilots, in 2010. Around 1000 women served in the WASP, though by the time the medal was granted only a third of them were still alive to proudly accept it. Still, they are women who were granted an equally high honor. The only difference between the Congressional Medal of Honor and the Congressional Gold Medal is that the President grants the former, the Congress the latter. If this book wanted to be a cute, fresh, contemporary tale, then it should have avoided stitching Walker's story onto its thin premise in an effort to give meaningful weight to the theme. Mary Walker deserves better than this. And so do young readers.